And the real solo traveling began. My accidental travel buddy in Vietnam has gone back to the Philippines while I continued my way to Cambodia. The morning of my departure, I tiptoed my way out of the room at Koniko Backpackers Hostel so as not to disturb my roommates. My bag was markedly heavy this time with all the stuff that I bought from Ho Chi Minh to take home with me; nothing too fancy, just a few pasalubong for my friends and family. There’s a man sleeping at the lobby and I was careful not to awaken him. But when I saw that the gate was closed, I was left with no choice. I went inside and waited for the staff to validate my ticket. There were other tourists waiting inside the office either for the same reason as I did or to buy their ticket. Some were backpackers, others were carrying huge luggage bag that could fit a person. It makes me wonder how long these people would be traveling. I booked the seat behind the driver. Fortunately for me, the seat beside me remained unoccupied during our trip from Ho Chi Minh to Phnom Pehn. The extra space helped me sleep better. I inspected the bus because I read some reviews online that described it as old and worn out. To some extent, the reviews were true; the bus does look outdated, but then again, I’d seen worse back in my country. All in all, my experience with Mekong Express was good. I liked that the backrest of the seat has a support for the lower back, which enabled me to bear the long travel comfortably. 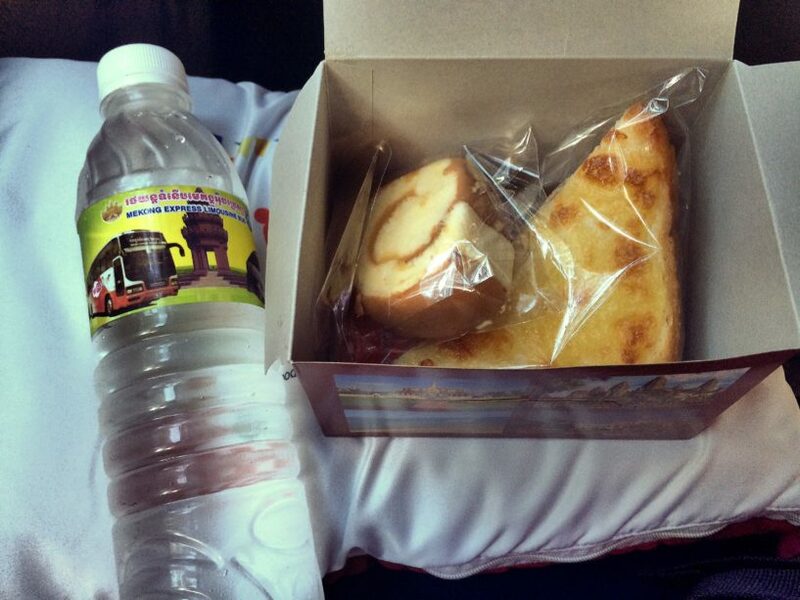 I also appreciated the bottled water and some pastries that they provide for snacks to the passengers. The bus conductor is a dark-skinned man with chinky eyes. Unlike the bus conductor in the Philippines, he doesn’t issue tickets, his role is to make announcements and to assist the passengers on what they should do during border crossing. He delivered his announcements, first in Khmer language, then in English, neither of which I was able to understand due to his accent. I just stared at him helplessly as I failed to grasp the message he was trying to convey. 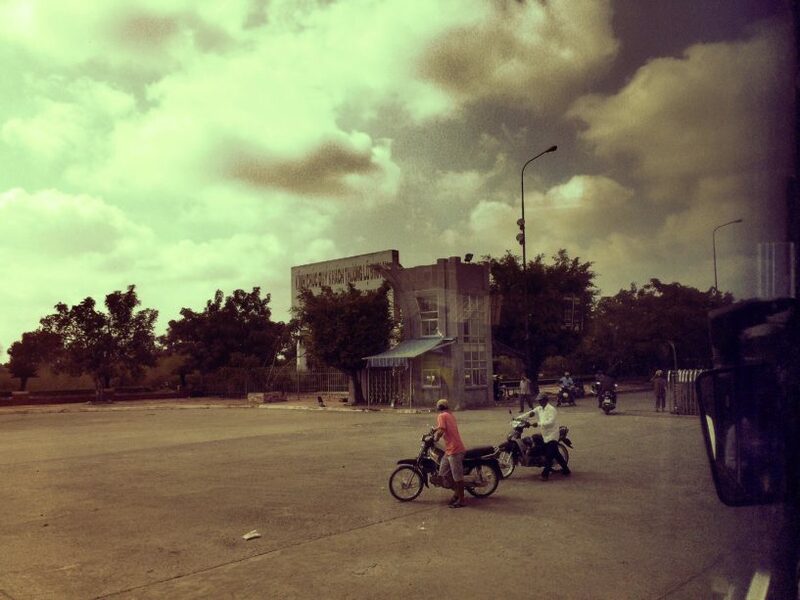 At 9:15AM, we reached the boarder that separates Vietnam from Cambodia. The bus conductor took our passports, directed us to alight from the bus and to enter the immigration building. This is the first part of the border crossing process. The Vietnam immigration checked our passports and collected fees when applicable. Being Southeast Asian, I was lucky that I didn’t have to pay for immigration fee. I just waited patiently for my passport to be stamped, that’s it. We were in the immigration for at least 45 minutes. 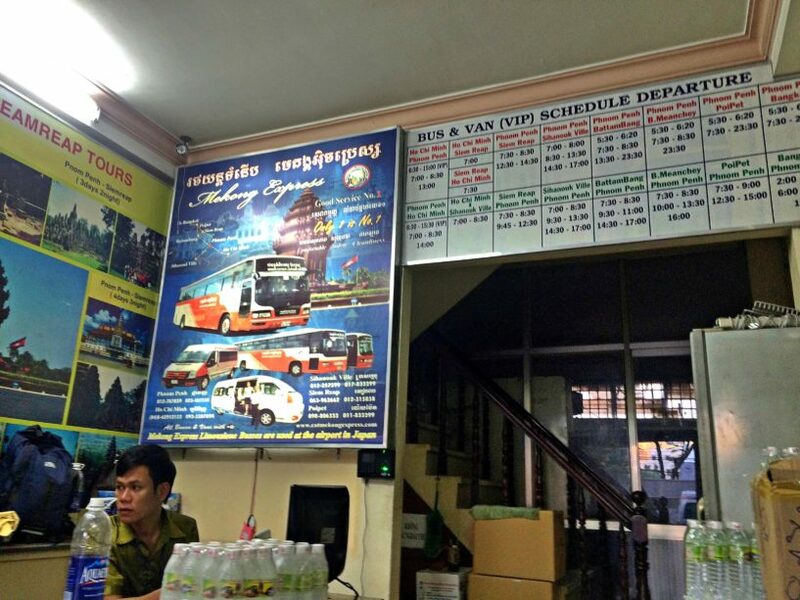 We went back to the bus, then 3 minutes later we were passing through another building that is the Cambodian immigration. The process only took 12 minutes this time. After getting our passport stamped with the Cambodian seal, we were back on the bus to continue our journey to Phnom Pehn. Taking photos inside the immigration is forbidden by the way. 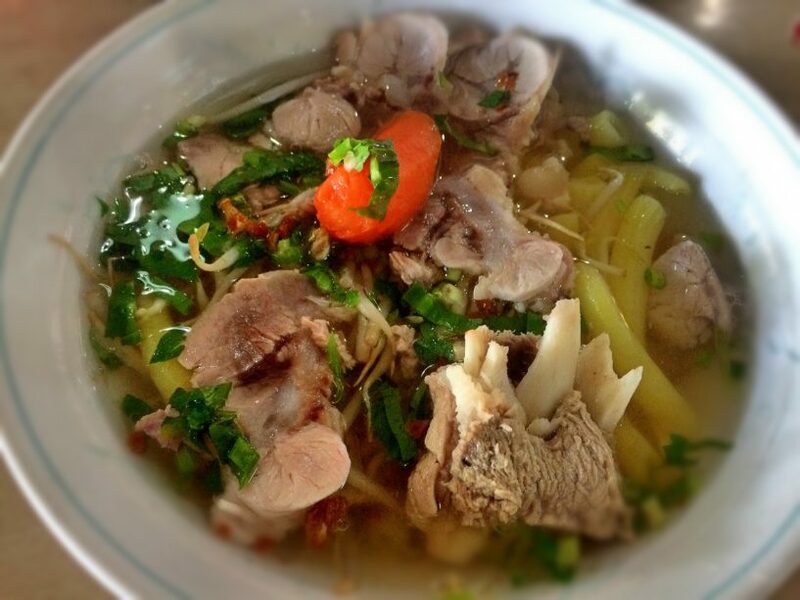 We had a stopover in this restaurant where I ordered noodles for VND 33,000 (PHP 70 – USD 1.50). It accepts both US dollars and Vietnam dong. I still had some dongs with me so that’s what I used to pay for my food. 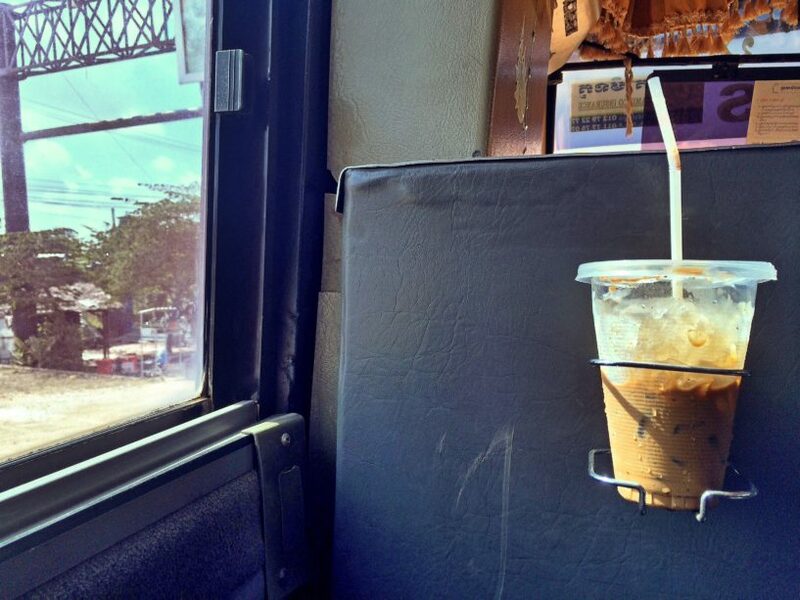 I also needed my fix so I got me some iced coffee for VND 20,000 (PHP42 – USD 0.85). 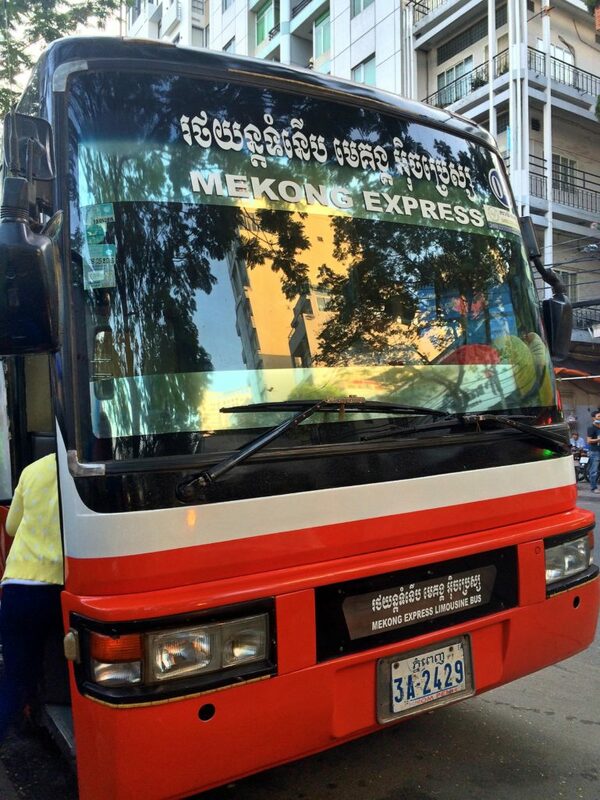 It was 2:20PM when we reached the Mekong Bus Terminal in Phnom Pehn. It was the final stop for some passengers while I and those who are also going to Siem Reap had to be transferred to another bus. The bus conductor on this one is a young Cambodian woman. When the woman started translating her announcements in English, I knew that I should just give up trying to understand them. Her accent is so heavy she sounded like she wasn’t speaking in English at all. And I am not being racist here before you start calling me that. If you don’t believe me, travel through Mekong Express. This time, I had a seatmate but I still managed to sleep (that’s what you call talent). At 5:30 we had a quick break in our journey. While the others chose to take the time for some early dinner, I chose to have some ice cream. I heard some passengers speaking in Tagalog, but I wasn’t in the mood to socialize so I just let them be. I saw them looking at me; maybe they sensed that I was also Filipino, I’m not sure. Finally, after 13 hours of travel, we reached our destination. It was already dark when we arrived at the bus station. There are some tuktuk drivers waiting, offering their services so I approached one of them. I showed him the address of the hostel where I’d be staying. He nodded and charged me USD4 (PHP188). It was a relief for me to be paying in dollars because I found the too the many zeroes in the Vietnam notes profoundly confusing. Cambodia accepts both Riel and US Dollars. This is my first time to ride a tuktuk and I found it very comfortable and spacious compared with the tricycles that we have back home. It only took 23 minutes to get from the bus terminal to my hostel. I was too early for my check-in so I had to pay an additional USD7. And so I arrived safely in Cambodia and I felt lucky that nothing bad happened along the way, including not having an issue with the immigration. It was a long tiring day and I didn’t know what Cambodia has in store for me. 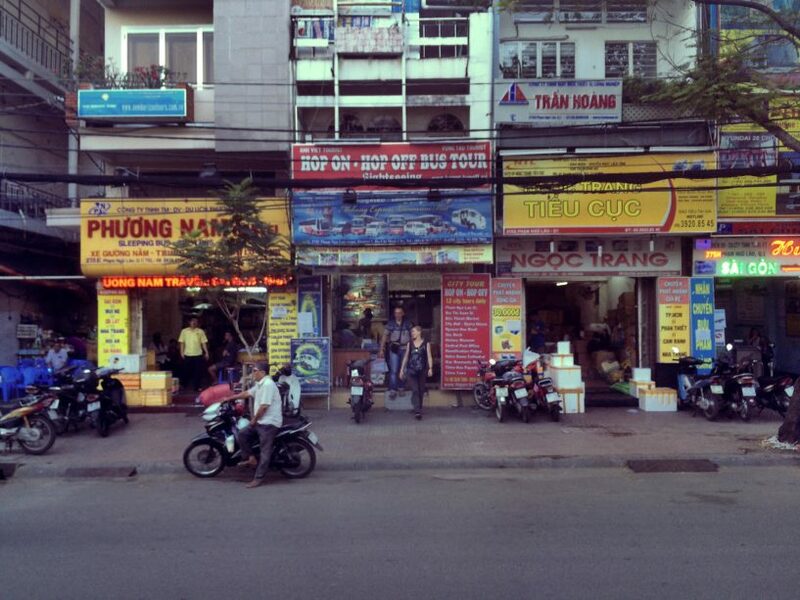 I slept on my bed with a renewed hope that my time in Cambodia would be so much better than my time in Vietnam. I think you could be my best travet mat! I love your tthrilling stories. hi katukayo..so glad that i found this blog about crossing borders ?..i’m traveling next week to ho chi minh then siem reap, solo traveler as well, and since its my first time i am clueless and so many whys and hows in crossing borders?..i hope i won’t get scammed or anything ?..in thailand kasi, once they found out na we’re not thais, they always try us to pay more like in tuktuk and taxi..but then i survived staying alone just in the city for almost a month?.. Hi Edel, don’t worry, we don’t have to pay visa fees when we crossed borders since the Philippines, Cambodia, and Thailand are part of ASEAN. Just be extra careful with the scammers, I heard there are lots of those in Thailand. thanks a lot for this?..from my hostel in pham ngu lao hcm i took a cheaper bus from hcm to phnom penh for about 9USD (6-8hrs), it was fine it’s just annoying that everytime we stopped the mosquitoes kept going inside and picking up passengers that caused the travel make it longer, there’s free wifi only upto the border and a free bottled water..and when we arrived in phnom penh, there’s a bunch of tuk tuk drivers offering me to take me to my hostel for 5USD?, i keep on saying NO until the price went down to 2USD ? (it’s still pricey though, we can take taxi already in ph for that price? )..i love Phnom Penh&Siem Reap as well as Cambodians than Ho Chi Minh/Vietnamese..i just find it too pricey (both country) the reason why i did not go shopping a lot?.. You deserve a salute or a standing ovation for this, Marge. Border crossing can be very terrifying to some, but you managed to do it despite of the bad experiences you had in Vietnam. I would love to try border crossing alone too. Too bad maybe I can do that maybe next year na. I love how you weave and tell your story here. It flows naturally,you know like water. LOL> galing mo talaga! Good thing you knew what to do.. even if the conductors spoke english with a heavy accent..
We also felt the same way about taking extra effort to listen so we could understand the English announcements. After a few days in Cambodia, it became easier. That was quite a long travel you did because I remember it’s already quite the distance traveling by bus between Phnom Penh and Siem Reap. Cheers to traveling solo. Well done! This was such an exciting story. I love this kind of travel, it’s it the easy kind but it’s a story worth telling. I always have respect for my fellow solo travellers! I’m also going to Davao in June! I’m excited for you Airina. And yes, nothing wrong with traveling our country first. We have so many beautiful places to explore here. I haven’t tried solo traveling yet, and to a foreign country at that. It’s in my bucket list though. I could feel your helplessness when you couldn’t understand the English of the locals because of the heavy accent and how using other currencies can be confusing. It sounds scary and exciting at the same time. When I do solo travel out of the Philippines, I’ll remember this and tell myself these feelings are normal. Glad you’re safe! I still fear of traveling solo (which I have to do next month huhu). I’m not confident and I probably have the worse sense of direction. Do you have any tips for me? Hi Melissa, nervous is normal but you can do it. Be extra vigilant, don’t be afraid to make friends, ask questions, and keep important documents with you at all times. Enjoy your first solo trip! 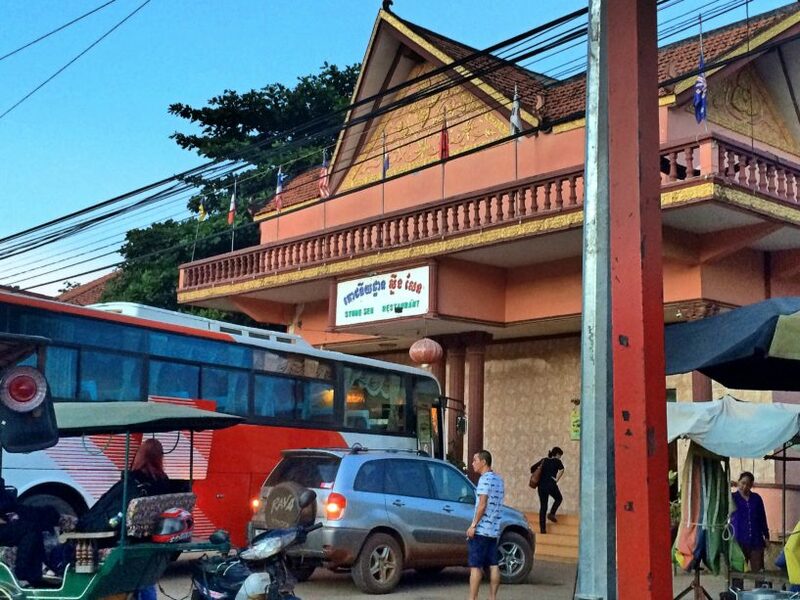 Looks like you’re having an exciting adventure in Cambodia. Haven’t been to that place and I’m curious how safe it is to travel solo. 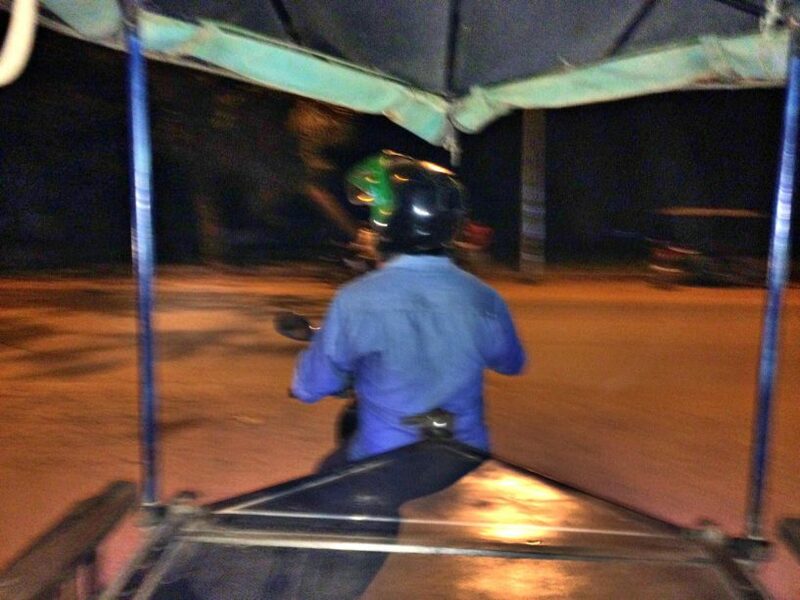 I remember when I took my first tuk tuk. I had so much fun. I was with a group of friends in Amsterdam and I loved it. Smart that you took the seat behind the bus driver. I really love to travel with the exit seat in planes to for the same reason! Glad you made it safely! Hope you’ll enjoy Cambodia as well. 13 hours of travel? Phew! I don’t think I could survive that. Haha. That is so interesting! 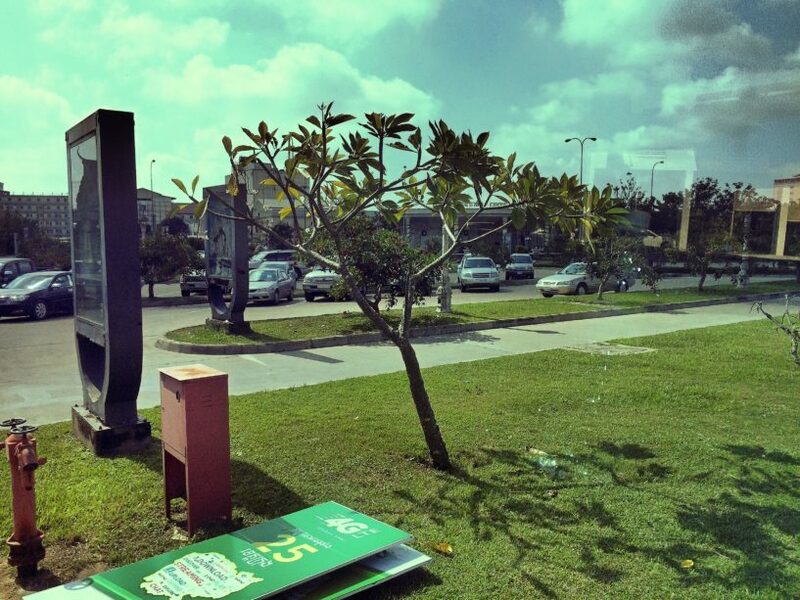 I have never had that experience of going through countries on a bus and never thought about what they do. I really enjoy your writing. You are so honest and real that I feel like I am getting the insider scoop on your travels! We really enjoyed Siem Reap (didn’t arrive by bus though). about 7 hours is my max on the bus, after that I have to find an alternative. Enjoy your trip. Cambodia is lovely. I loved their iced coffee, definitely one of the best-tasting coffees I’ve had in my life. Looks like an amazing trip! Glad your border crossing went well, and have a safe trip! Cool post and you are so lucky to have been able to travel to these places and experience the various culture! My friend went to the same places- she said it was exhausting, but worth it. Do they have those night trains there as well? What a journey! I haven’t been yo those countries yet but I know communication would be an issue.Glad your trip into Cambodia was safe. Yes, I do have that talent hahaha… I don’t even know how can I sleep on a moving vehicle. I went to Vietnam in 2009 and reading through your experience not only made me remember some elements that I had forgotten, but it also made me terribly nostalgic! I envy people like you who could travel whenever they want to! I stopped travelling a lot when I had a kid. Maybe when she grows older, we would travel again! Enjoy your travels! Such a brave soul to travel solo especially in places very unfamiliar to us. Would like to do that as well and enjoy the perks of not thinking of the needs and rants of travel buddies. Enjoy life! The adventure continues. Traveling can be cheap if you want it to be, and in your case, fitting the trips you make within your budget has given you more chances to see many other beautiful places… beautiful is arguable, but it is fair to say experience and absorb the culture. I agree, it’s all about managing your finances when traveling. I laughed in the part of ‘not in the mood of socializing’. If I heard someone or a group speaking in Filipino in a foreign country, it excites me for some seconds then I immediately transformed into ‘introvert me’. Haha. That was a long yet stress free travel in terms of immigration. More safe travels! You are one brave lady. I’d be scared to death traveling solo in a place where I couldn’t understand anybody. Glad you made it to your destination safely. Sounds like a good journey! I’m glad you made it safe and comfortably and with some sleep to boot! Thanks Holly, yes I did. That’s the good thing with Asian border crossing it’s easy when you have local Asian passport. I wouldn’t have the patience for the long journey though. To be fair, I think this is also true with westerners who travel in western countries, where us, Asians, couldn’t just make do with a passport and have to present a visa. Glad everything went okay for you and you arrived safely. That 13 hour bus journey didn’t sound too bad! Hope you enjoy your stay in Cambodia. I did enjoy my stay there, thanks Paul! Haha! I cracked up when you said you were in no mood for socializing. It sometimes happens to me.. 🙂 . Glad you arrived safely. The food looks awesome The bus doesn’t sound too bad either, but l can imagine coming from the western world, it is a bit shocking to them. Hahaha… Yeah, it’s my introvert side kicking in. I haven’t been to western countries so I really don’t know how modern the buses there are. The bus is okay right? Glad the border crossing went so well. Enjoy Cambodia, it’s a great country! Glad you arrived well in Cambodia! Bus rides could be a pain but good you had a pleasant trip. Take care and more adventures to you!